Fall armyworm (Spodoptera frugiperda) (FAW): FAW continued being a problem to maize and other crops in southern and eastern Africa during March. African armyworm (Spodoptera exempta) (AAW): AAW outbreaks were not reported during March, however the pest will likely appear in Eastern Africa and the Horn region during the forecast period. FAW continued being a problem to maize and other cereal crops in eastern and southern Africa. In Ethiopia, the pest was reported in maize fields in 915 kebeles in 173 districts in seven regions during 7-27 March, 2018. Of the 244,931 ha of rainfed and irrigated maize crops planted as of March 27, 2018, 30,645 ha were reported infested and 12,604 ha protected with chemical and cultural means (PPD/Ethiopia). In 2017 cropping season FAW infested more than 692,000 ha of 2.9 million ha of maize planted. On average the damage was estimated at 5.2% with a total loss of more than 134,000 tons of crops or close to $29 million across the country. FAW outbreaks that affected millions of small-holder farmers across the country during 2017 cropping seasons forced GoE and partners to prioritize implementation of the 2018 FAW work plan (OCHA 11/3/2018). In South Sudan, FAW was detected in early planted maize crops in Yambio County in Western Equatorial State during late March, 2018. The pest was detected in areas surrounding Yambio Town. 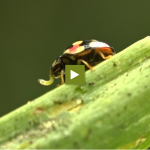 As planting progresses across the country the pest will continue appearing over vast areas. 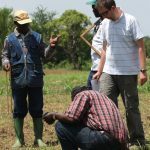 Active surveillance, monitoring, routine scouting and control interventions remain critical to abate major crop losses. In Kenya, FAW outbreaks were reported in Kericho, Nyeri, Embu, Nakuru and Meru Counties attacking early planted maize. Control operations were launched by the affected farmers. 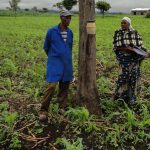 In Tanzania, the pest was reported in most regions of the country and control operations are carried out by the affected farmers with technical and material assistance from the Ministry of Agriculture (IRLCO-CSA). In Somalia, PPD earlier reported FAW in irrigated sorghum, but further detail was not available at the time this bulletin was compiled. In Madagascar, FAW was first reported in November, 2017 and continued through February and March, 2018. FAO dispatched an assessment team early March, 2018 to conduct assessments and provided training to NPPOs. As March, 2018, FAW has been in all of sub-Saharan African countries, but Eritrea, Lesotho, Mauritius and Seychelles. AAW season has ended in the southern region in Malawi, Mozambique, Zambia, Zimbabwe, etc. No outbreaks were reported in the central region. AAW: AAW outbreak will likely appear in the central northern outbreak areas in Tanzania and Kenya and perhaps southern Ethiopia in areas where seasonal rains have been reported, and cause serious damage to crops and pasture during the forecast period.